These candy cracker bites are delicious, no-bake and super easy to make. They are green and perfect for St.Patrick’s day parties. These St. Patrick’s Day candy cracker bites were a result of me realizing that I DON’T have many recipes related to St.Patrick’s day. I think it’s probably because getting creative with the color “green” is so freakin HARD! Honestly, I really DON’T like that color. It REMINDS me of puke and slime and all sorts of other NASTY stuff…YUCK! That explains why the few St.Paddy’s day treats on my blog are NOT green at all. There is this colorful Irish trifle, inspired by the flag of Ireland. And finally…a rainbow sprinkles cake! Yup… I only have 3 St.Paddy’s Day treats to share with you. And that’s just sad…right?! lol. 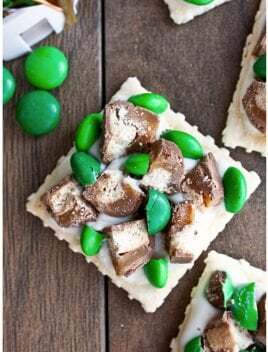 Simple crackers topped off with melted white chocolate, green m&m candies and pieces of Twix bars… Mmmmmmm! You can use other chocolate bars instead of Twix but those are one of my absolute FAVORITES! I couldn’t imagine making these cracker bites with anything else. For something so simple, these crackers tasted fantastic! They are sweet and slightly salty, very crispy and choco-licious! Make sure to make LOTS of these bite sized cuties coz they WON’T last long. Pour melted white chocolate on top of your crackers. Then, place some chopped up m&m candies and Twix pieces on top. Let the crackers sit at room temperature for about 15 minutes until the melted chocolate hardens. Enjoy! Those look like so much fun! I don’t have any st.patrick’s day sweets to share, that’s even more sad, right? XD I should be living more green like you. These sound so good! I don’t think I have any St. Patrick Day foods on my blog at all! I’ve got to come up with some!